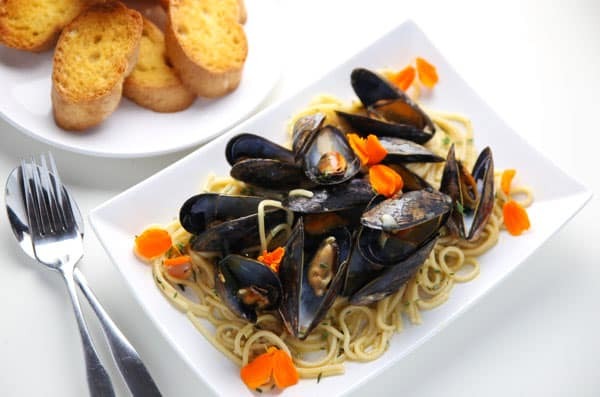 These White Wine Mussels With Pasta (Gluten Free) come together in less than 30 minutes and all in one pot! This has to be one of the easiest, delicious meals I’ve ever made! 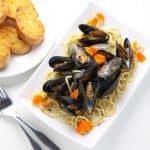 I used to be super intimidated of making Mussels. I always thought of them as a fancy meal you would order in a restaurant and that it would be too hard to make at home. Boy was I wrong! Seriously you guys, this is like the easiest dinner I’ve made! 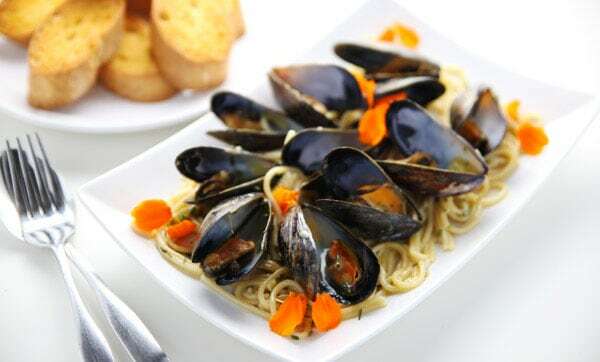 Plus Mussels are relatively cheap, usually around $5 or $6 a pound. 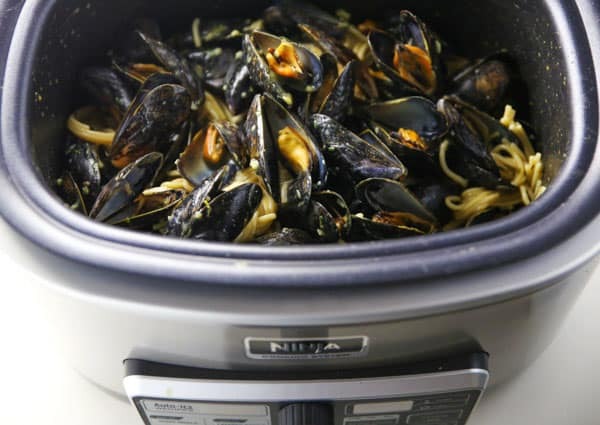 I made this recipe for two people, so I only needed about two pounds of Mussels. The total price of this meal including the pasta was under $15! You would probably pay way more for this in a restaurant. Oh and the best part? Everything cooks all in one pot! 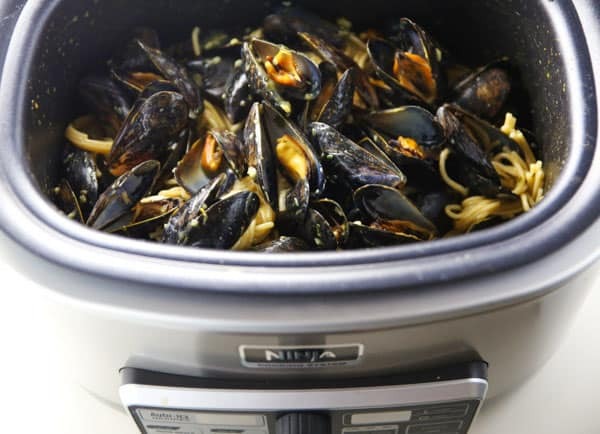 Yep, Pasta, Mussels, and Sauce all cooked in the Ninja® Cooking System with Auto-iQ™. I love this new kitchen appliance! Actually the Ninja® Cooking System with Auto-iQ™ is four appliances built into one: a slow cooker; a stove top for searing and sautéing; a steamer; and an oven for baking. It’s different than a slow cooker that only heats from the side. Ninja’s Triple Fusion Heat® brings bottom, side, and steam heat together for easy one-pot meals like this one I made today. It’s super cool because it has this Auto-iQ™ Technology that features more than 80 pre-programmed recipes. 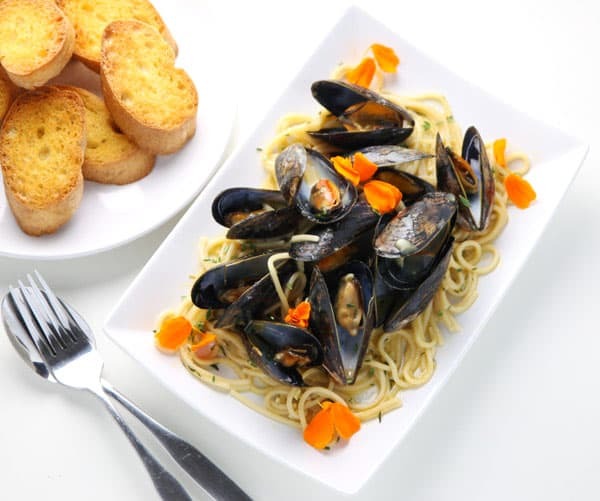 This comes with a Ninja® Delicious Done Easy cook book as well that has over 100 recipes. Just select a recipe number, add ingredients, and let Auto-iQ™ cook for you. Choose from quick meals, layered bowls, poached infusions, and grains. I used one of their pre-programmed recipes out of the cookbook that comes with this and just tweaked it a bit using different herbs, and substituted with gluten free pasta. I just added everything to the pot, put the lid on, and pressed the pre-set button for this meal. 25 minutes later dinner was done! I’ve actually been using my Ninja Cooking System with Auto-iQ for a variety of things. Over Thanksgiving it was a total life savor. My oven was filled with a giant turkey and there was no room to cook anything else in there, so I used it to roast my potatoes in. It can also be used as a Stove Top. You can use it like a skillet, sear meat, and sauté vegetables in one pot. Or you could use it as a steamer. It comes with a wire rack to place inside, just set your veggies on it and steam for an easy side dish. You can also do Layered Bowls with this, which I am super excited to try out. I’m thinking this would be perfect for weekly meal prepping! I also like that it has a an Auto Stay-Warm and programmable digital timer, which is great for dinner parties, to keep food warm. And the best part? The pot, lid, and wire rack are all dishwasher safe which makes cleanup a breeze! Use my code SARA15 to receive 15% off your very own Ninja® Cooking System with Auto-iQ™ – good from now until Dec. 31! They are giving out Twenty (20) Ninja® Cooking Systems with Auto-iQ™ between now and December 31, 2017! (Winners will be randomly selected from all program entries and Ninja will facilitate fulfillment of the 20 winning prizes).